Growing basil is an indispensable summer ritual. The first time you squeeze a handful of leaves under your nose, and open your hands to release the fragrance, that’s when you know it’s summer. Basil only flourishes when it’s hot. It’s abundant at high summer, just when you need it...for sautéed zucchini. 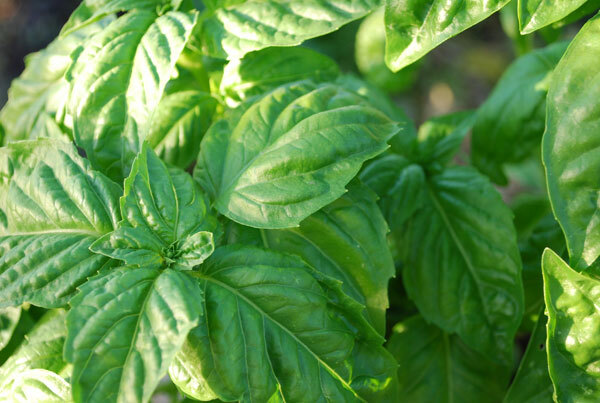 Whether you harvest a few leaves fresh, and use them in sauces or sautés, make pesto for pasta, or dry the leaves, and use them throughout the year in the kitchen, basil is the one summer herb no cook or gardener should do without. Growing basil is easy. 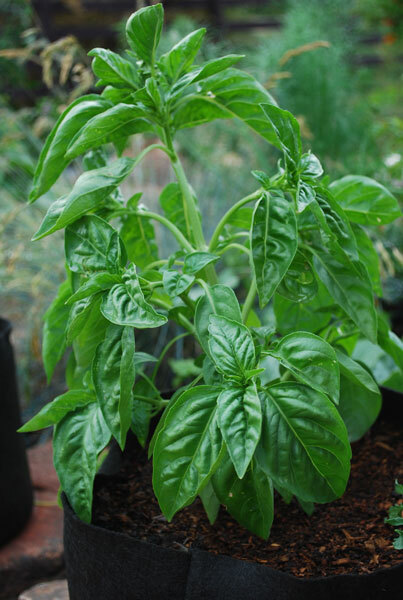 Give it plenty of sun, moderately good soil and regular water, and as long as it’s warm, basil thrives. Basil thrives in containers, window boxes, and planters, so it’s easy to keep a steady supply growing right outside your door. As long as the weather is warm—temperatures in the 70’s (20’s C)—growing basil is easy. 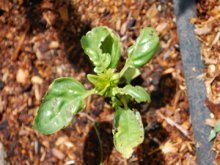 When the temperature drops, basil suffers more than most plants. Beginning gardeners usually plant basil too early, while the nights are still too cool for it to thrive. Snails, slugs, and earwigs love the new growth on tender basil seedlings. If the weather stays cold, the plants can’t outgrow their nighttime munching. Students ask me why their basil is growing so slowly, and why the leaves are pale, small, and puckered, and I tell them, ‘wait until we get some heat’. After the first heat wave, the plants take off. At the first touch of frost, basil drops its leaves, so don’t waste time planting before the last frost date for your area. Harvest basil when the nights start cooling off in the fall, well before the first frost. For information on harvesting, drying, and preserving basil, see Harvesting Basil. Basil does well in any good garden loam. It needs good drainage and abundant organic matter to thrive. Treat it like you would a vegetable, and you’ll be able to make lots of pesto. 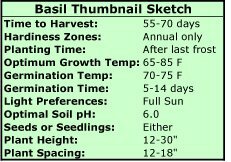 Soil amendments added for tomatoes are perfect for growing basil. If your soil is lean or you’re short on compost, you can amend the soil with good organic fertilizer like Dr. Earth Organic Tomato, Vegetable, and Herb Fertilizer. This is a balanced (5-7-3) blend of fish meal and alfalfa meal for early-season growth, feather meal for mid- to- late-season growth, soft rock phosphate and fish bone meal for phosphorous, and kelp meal for potassium and boosting plant immunity. 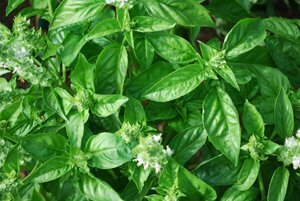 The Romans saw basil as a contrary plant, and believed basil wouldn’t grow unless the seeds were stomped on and cursed when planted. I’ve tried this, and it actually works…but so does a gentler touch. Start seeds indoors a month or so before your last frost date. Place the pot in a warm place—on top of a cabinet or the fridge—and keep moist until seeds germinate (usually 5-14 days, depending on temperature). If you have a seedling heat mat, it’s even better. 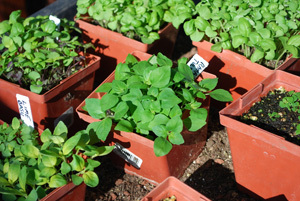 Move to a sunny window or put under bright lights as soon as seedlings emerge. 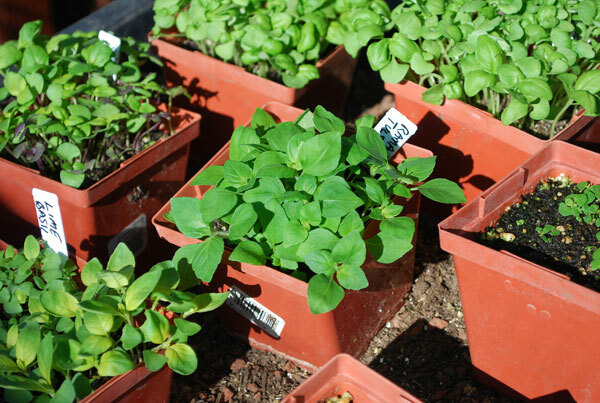 Whether you start your own basil seedlings, or buy them from a nursery, don't set them out till temperatures reach 60-70° F (15-22° C). In a single-dug bed (soil prepared to 1 shovel depth), set plants in rows 12” (30 cm) apart. Plant Genovese and Thai basils 10” (25 cm) apart, and smaller varieties 6-8” (15-20 cm) apart. In a deep-dug or raised garden bed (soil depth at least 18”—46 cm), plant on 10” (25 cm) centers in staggered rows. 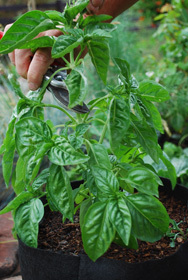 Basil pairs well with tomatoes both in the kitchen and in the garden; it’s an ideal companion plant for tomatoes. Succession Planting: If you’re growing basil with a long season, when you set out seedlings in the spring, sow a small swath of basil seeds in another part of the garden at the same time. This second patch will mature a few weeks after the first, giving you a steady supply of fresh basil through the summer. 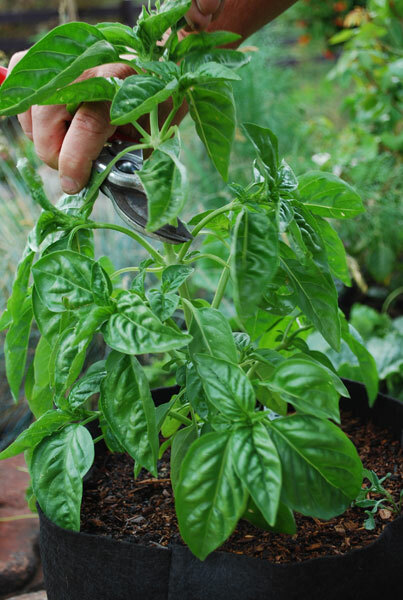 Basil requires regular watering, especially if you're growing it in containers. 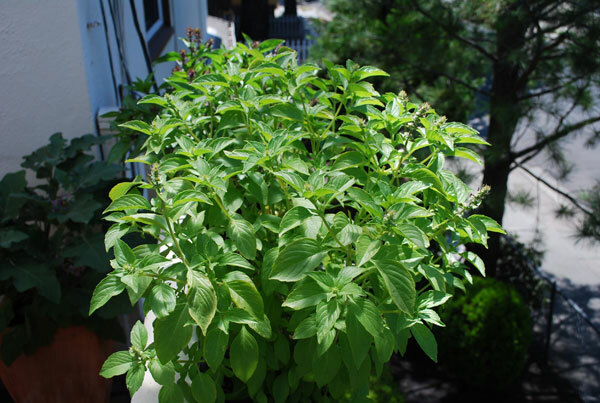 As long as it has enough water, basil thrives on sun and heat. Basil is a heavy feeder for an herb. It’s best to add a good organic fertilizer like Dr. Earth Organic Tomato, Vegetable, and Herb Fertilizer at the time of planting. A light shot of fish emulsion, worm tea, compost extract, or compost tea a month after planting will help encourage succulent growth. Shaping the Plant: When the plant is about 6” high, pinch or cut the main stem off just above where a pair of side shoots branch off the main stem. This encourages a branching, bushy shape that maximizes leaf area. Keep those Flowers Pinched Back! Pinch back the flowers as they form, to encourage more leaf development. The longer you can keep ahead of the flowers, the longer your plants will produce leaves, the part of the plant you eat. Once the plants start flowering and setting seed, leaf production stops. When basil flowers—and it will flower, in its time, no matter what you do—all is not lost. You can still harvest the leaves that are there, or you can just let the plants go to the bees. 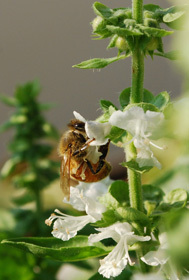 Basil is great for honeybees and other pollinators. If you’re growing basil for the bees, let some plants flower. Your basil will hum with bees, including bumblebees and other native pollinators. See Attracting Beneficial Insects for more information on attracting and sustaining beneficial insects. 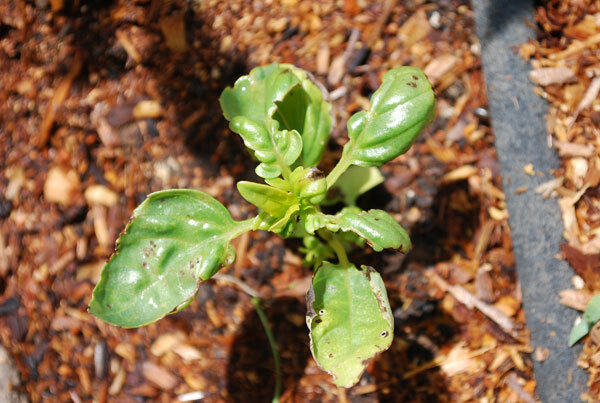 Basil has few pests or diseases. Some strains may be susceptible to fusarium wilt. Usually one branch will wilt from the tip down, then the whole plant will wilt, turn brown, and die a few days later. 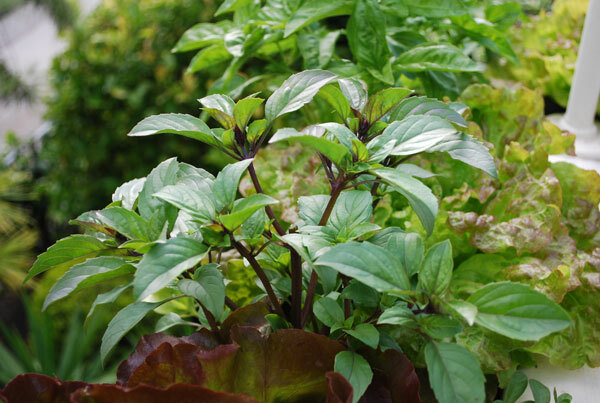 ‘Nufar’ is a Genovese basil variety that’s resistant to fusarium wilt. If you’re growing basil where fusarium wilt has been a problem, Actinovate Organic Fungicide may help. Actinovate contains Streptomyces lydicus, a bacterium that’s harmless to mammals, birds, reptiles, fish, and insects, but bad news for fungi and bacteria that attack plants.